Bac Lieu (VNA) – The establishment of a hi-tech shrimp farming zone in the Mekong Delta province of Bac Lieu approved by the Prime Minister is expected to create a momentum for the locality to build itself into a centre of shrimp industry in Vietnam. Director of the provincial Department of Agriculture and Rural Development Luong Ngoc Lan said the zone will support the seafood sector in the Ca Mau peninsula in general and Bac Lieu in particular. It is estimated that close to 500,000-600,000 hectares of shrimp farming in the peninsula will benefit from the project which encourages the application of the latest science and technology. According to Chairman of the provincial People’s Committee Duong Thanh Trung, 270 out of the total 420 hectares of the zone will be for super-intensive farming, which is able to produce 100-300 tonnes of shrimps per hectare. The application of this model will have strong impacts on the restructuring process of the local agricultural sector towards increasing added value and sustainability. The Ca Mau peninsula boasts the largest farming area of shrimp in the Mekong Delta with nearly 552,000 hectares in 2015, accounting for 88.8 percent of the region’s total area. 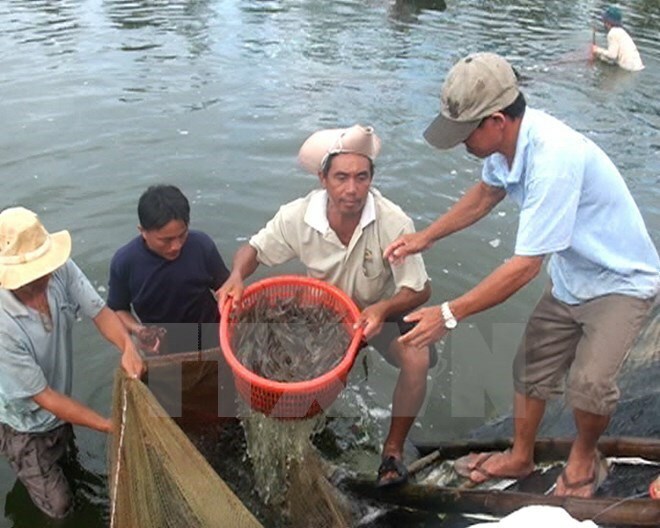 Though Bac Lieu ranked second in the area of shrimp farming area (124,000 hectares, after Ca Mau over 280,000 hectares), its output is leading the region with nearly 105,000 tonnes per annum.